What is Technical Optimization? It's The Difference Maker. When most people think about SEO (including the vast majority of SEO professionals), they are thinking about creating optimized content, building links and off-site authority signals through social networks and brand citations. The fact is, the majority of SEO professionals and agencies do not adequately address technical optimization. What is technical optimization? Why effect does it have on your website? How do you do it? You are about to find out! Let’s think about search engine spiders, the simple little programs that search engines use to crawl and index your site. Spiders find the information on every page throughout your site, bring that information back to their data center, categorize it, score it and store it for instant retrieval when someone performs a search. The problem is, when search engine spiders get to your site, they are kind of like a blind person in a maze. They don’t “see” your content, and their job is very different than a web browser. Search spiders look for very specific indicators to help them understand your content. Optimizing your code gives those blind spiders 20/20 vision. 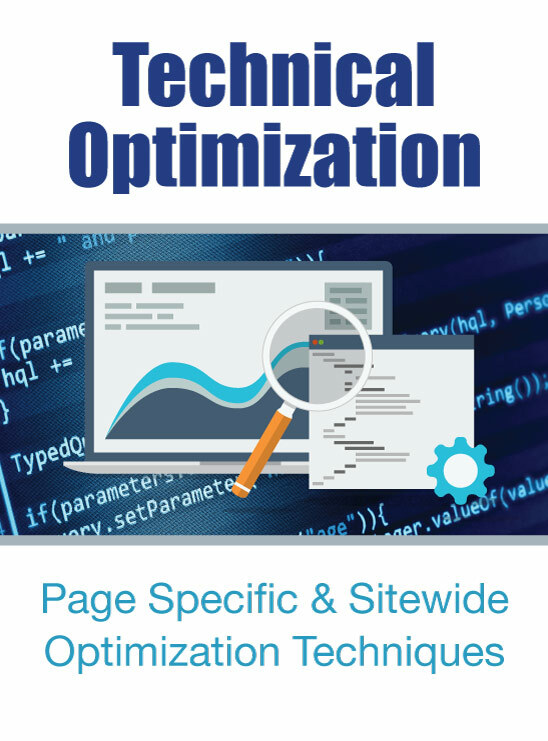 Technical optimization helps search engines better understand your content and that gives your site priority over other less optimized sites. It is true that a very large percentage of SEO is about getting links from around the web pointing to your content. Many SEO’s go so far as to focus solely on link building. But, technical optimization can make your site resonate so much more powerfully that you can actually achieve better search rankings with a fraction of the links that an un-optimized site would need. And let’s face it… link building is easily the most difficult, time consuming and dangerous SEO task. That is why great technical optimization is one of the best things that you can do. It will make all of your other efforts that much more impactful. Of course, if you have a site that has been focusing on content creation and link building for a while and you haven’t been able to achieve top rankings yet… technical optimization can absolutely be the difference maker. Many of the recommendations in this technical optimization course will require a developer to implement. However, being familiar with these issues will help you be much more effective in managing any developers that you are paying to handle the technical aspects of your site. So, don’t let the “Technical” title fool you… this is stuff that you absolutely have to be familiar with. Each section provides a high level overview with the key points and then also goes deeper into the technical implementation. This course is as important for website owners and managers that don't even know code, as it is for developers. By becoming aware of the types of signals search engines look for, you will be better able to ensure that your business is doing the right things to be successful. So, what are you waiting for? Let’s jump in and get your site optimized!